My passion for cooking began in 1978, when a beautiful woman in St. Louis, Missouri introduced me to Bon Appetit magazine and The Good Cook, a cookbook mail-order club. From this cookbook club, I ordered my very first cookbook! My collection of cookbooks grew to nearly 500 books since then, many of which I have given away as gifts to my adult kids to start their own collections. 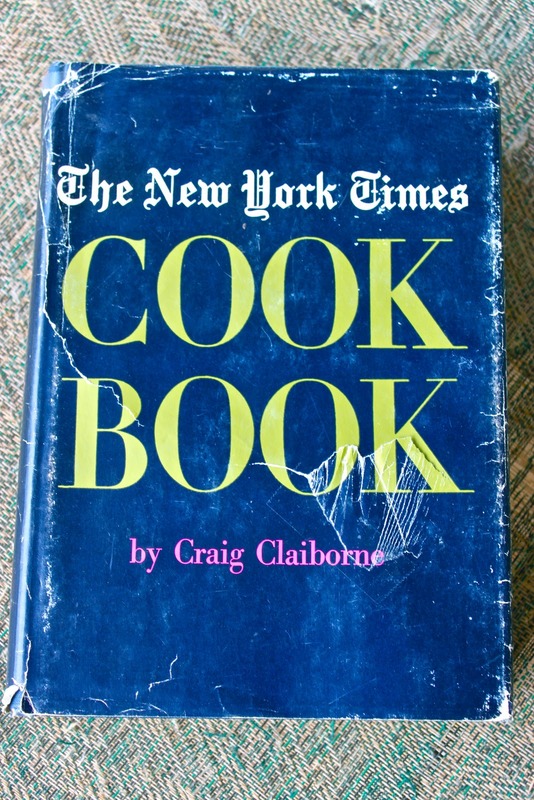 Considered a true classic today in the culinary literature, I chose The New York Times Cook Book, written by the late Craig Claiborne in 1961! Today in original form with dust cover this cookbook sells for around $70.00 as a collectible. At the time that I bought it in 1978, I had no idea that it would someday be considered so important in the culinary world. This cookbook is the source for this incredibly savory, delicious, and perfect pork tenderloin roast. If you’re lucky you have this book in your collection and/or library. The pork sizzles in a lemony, olive oil, garlic and herbal sauce that blends wonderfully into the pork while roasting! I’ve never made a better pork roast and I don’t think that I ever will. This recipe is extremely easy to prepare and it is quite simply . . . perfect in taste! 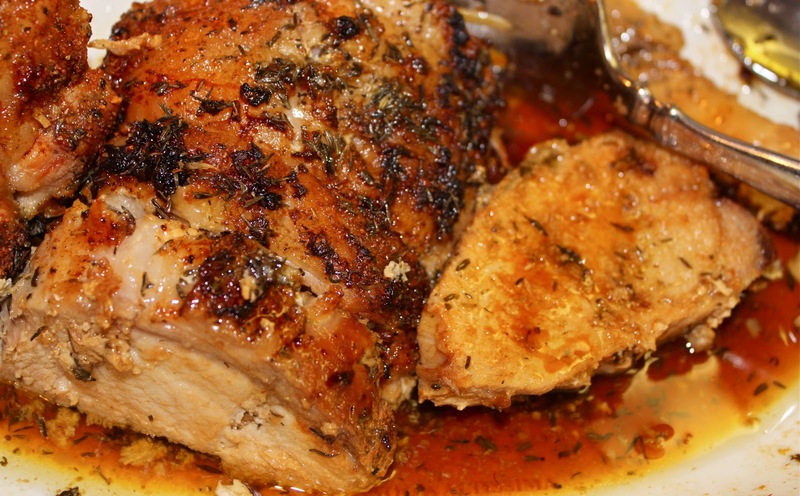 Here’s the recipe for A Perfect Pork Tenderloin Roast from a Classic Cookbook! Puncture the tenderloin with large, gaping holes/gashes on all four sides (for the sauce to penetrate into the meat and not just glaze it on the surface). Generously sprinkle the tenderloin with the 3 commercial seasonings above (Accent, Mrs. Dash, and Nature’s Seasoning). Blend the olive oil, lemon juice, thyme and garlic together in a small bowl (again don’t forget to double or triple the ingredients). Pour the sauce over the entire seasoned pork tenderloin, with fatty side facing up in a baking pan. Bake, uncovered, and roast for 2 to 2-1/2 hours at 350 degrees or 45 minutes per pound or 170 – 185 internal degrees on a meat thermometer. 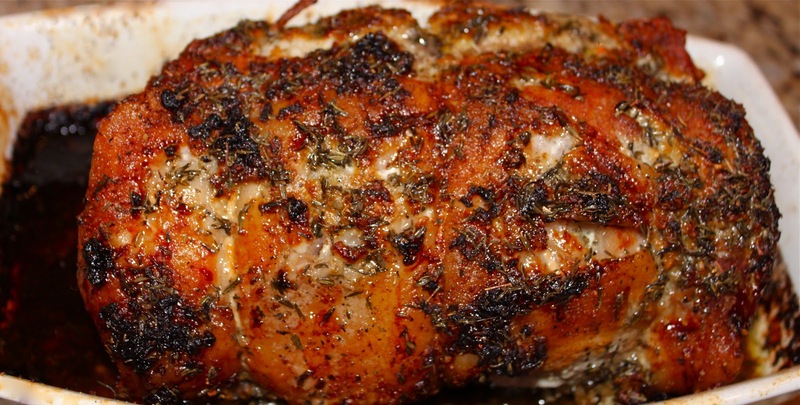 Enjoy this delightful pork roast! I serve this roast with my mother’s outrageously delicious Italian garlic and rosemary roast potatoes! 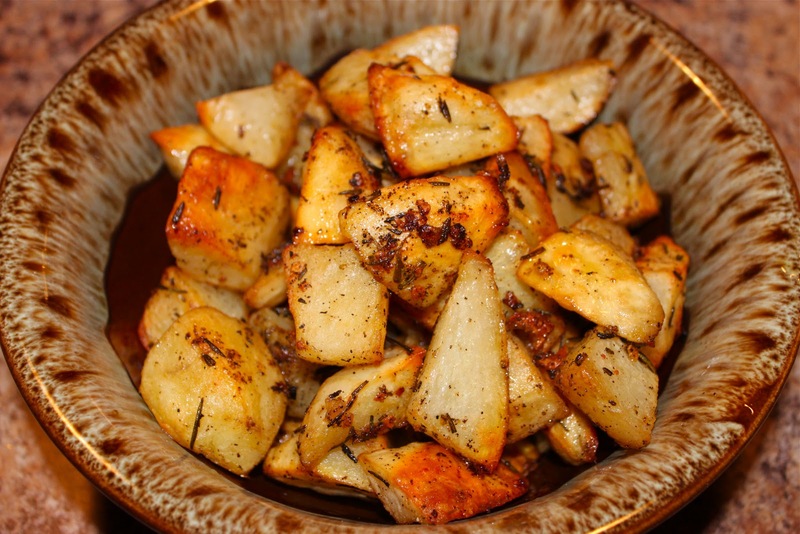 Idaho Russet Potatoes (my mother used 8 small potatoes in this bowl), cut into 1″ wedges. Freshly minced garlic cloves, about 4 large. Toss the potatoes in the olive oil. 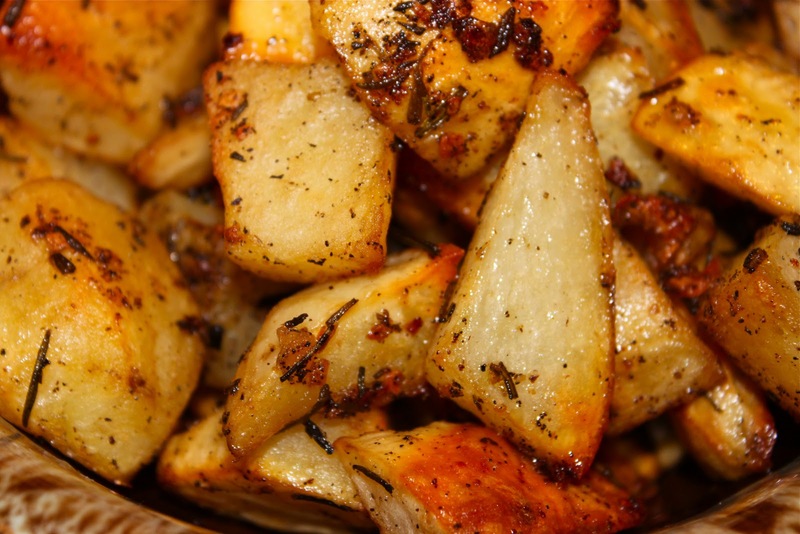 Sprinkle the rosemary and garlic all over the potatoes. Place in a glass baking pan in a 375 degree oven and roast for 45 minutes to one hour until golden brown and tender when pierced with a fork. The roast, juice, potatoes, and a croissant perfectly plated and smelling so incredible! A close-up shot to show off the beautiful bronze glaze of the sauce with the herbs and spices all over! One last close up of Mom’s Roast Potatoes with the olive oil, rosemary, and garlic finish! What a beautiful meal! I’ve been thinking about roasted potatoes lately. I think they are going to have to appear on our menu really soon. look at those fabulous potatoes, my family would flip for this dish wonderful photo’s too! 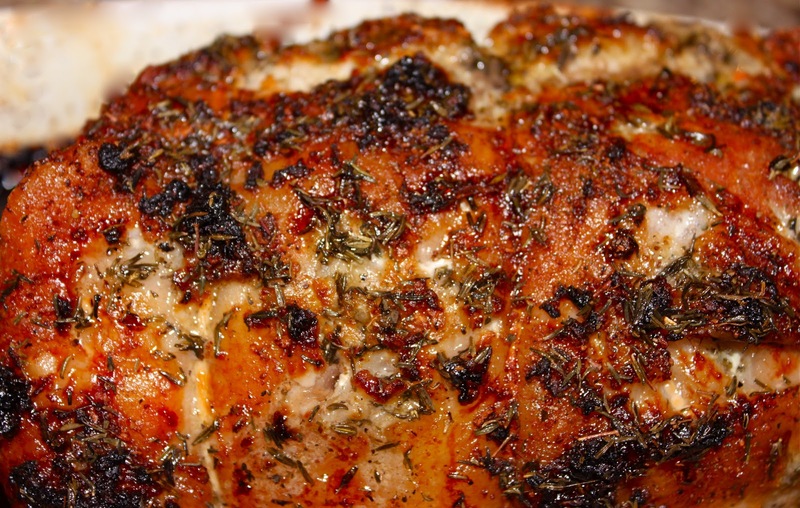 Roz – You captured the deliciousness of the pork roast wonderfully! I love all those browned and glazed bits on the outside. No doubt that this is a stunning meal and one where there are surely no leftovers! It sounds like this is one of your favorite and most treasured cookbooks. Candace, Anne, Claudia, and Catherine – It is a super-delicious meal and the potatoes are over the top! I hope you print it off for future reference to try sometime. Thanks for the compliments; but they all go to the original author…the sauce is unbelievable! Kim, I’m so glad that I held on to this cookbook, along with my Julia Childs and The Joy of Cooking. They may be old, but they are sure great resources in the kitchen! Yay the famous Pork Tenderloin recipe Roz! I was just thinking this morning about my very first cookbooks whioch were the Silver Palate series. Those ladies turned me on to some bold flavours which seem perfectly ordinary today! I just found your site today and have been here now for about 2 hrs. Love it and will be making something from it tonight. Delicious! Love those potatoes, too. I haven’t done roated pork tenderloin! Yours look perfect! Your roast is gorgeous and the potatoes alone look amazing…beautiful flavors! What a perfect classic meal. One of my first cookbooks was The Joy of Cooking and a Betty Crocker cookbook. I will be making this dish in the future. And I love roasted garlic potatoes. What a great meal! This looks amazing! Wouldn’t you know that I have pork tenderloin thawing on the counter . . .
That sounds(and looks) so good! Thanks for stopping by my blog to say hi. I’m going to have to do some reasearch and see if you have tips on how you take such fabulous photos of the (amazing) food you make. I’m hungry just looking at all of it. Have a great evening! I’m drooling from here. Wow. 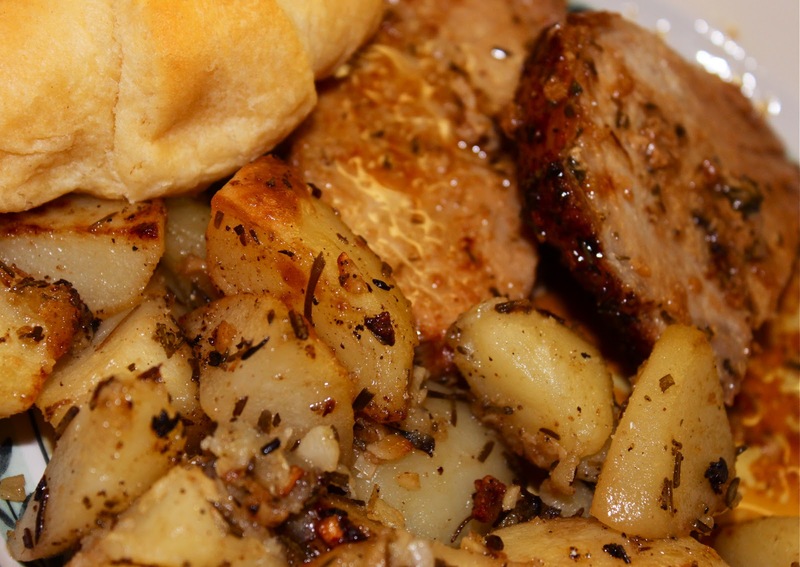 Love that beautiful crusty golden pork…the potatoes are equally mouth watering. Yum! I just found your blog and am so glad I did. I can’t wait to make this. Everything about this looks good to me, down the the browned bits on the potatoes. Garlic and rosemary are my favorites on roasted spuds. yum! Amazing sounding and looks awesome! I will be trying this. We do sweet potatoes at our house with rosemary and garlic and know my kids will love these also. Currently making these dishes! Smells divine! THank you! I just made this – and it was delicious. Current FDA suggestions say cook pork to 150. I made this and pulled the tenderloin out when the thermometer read 150 – and it was melt in your mouth perfection. Looks fantastic!! Quick quesyion. You call it a marinade but don’t mention if you marinate for period of time before cooking. Should I marinate for a few hours before with all that goodness? Wondering if you have ever added to potatoes, carrots, onions to the pork loin roasting pan? IF so, How was the result? Sounds and looks terrific. I’ll make this tomorrow. Question; do you really use all three of the commercial seasonings, Accent, Dash and Nature’s Seasoning?